The Conformance Module represents metadata about the datatypes, resources and API features of the FHIR specification and can be used to create derived specifications. The core FHIR specification describes a set of resources, frameworks and APIs that are used in many different contexts in healthcare. However, there is wide variability between jurisdictions and across the healthcare ecosystem around practices, requirements, regulations, education and what actions are feasible and/or beneficial. For this reason, the FHIR specification is a "platform specification" - it creates a common platform or foundation on which a variety of different solutions are implemented. As a consequence, this specification usually requires further adaptation to particular contexts of use. Implementation Guides are documents published by a domain, institution or vendor that describe how FHIR is adapted to support a certain use case (or set of use cases). An implementation guide combines a set of conformance resources and supporting narrative into a document for use by implementers. A capability statements use the conformance resources to document how a client or server has implemented FHIR, i.e. which aspects of the specification and API are implemented and how. Define extensions that can be used in resources or data types. Reference the Value Sets that specify the content of coded elements, see the terminology module for more details. The MessageDefinition describes messages that can be sent and received, including the driving event, contents to be exchanged and responsibilities on receipt. The OperationDefinition describes additional operations in addition to those in the base specification. Conformance resources may be used independently, not just within the context of an ImplementationGuide resource or capability statement. See the section Common use cases for examples of such uses. 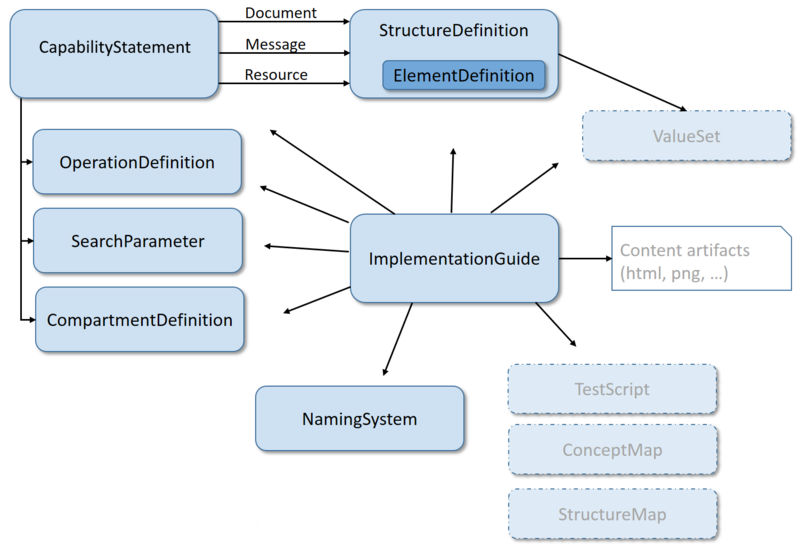 Resources shown with a dotted box are described in other sections of the specification: ValueSet, ConceptMap and StructureMap are from the section on terminology, TestScript is part of the section on Implementer Support. A server may be implemented in such a way that it will automatically support additional search parameters or compartments definitions uploaded to that system. This may result in searches that use large amounts of processing power, expose sensitive patient data, or both. If a server acts as a repository of conformance resources, it should tightly control modifications to its data: updates to conformance resources are usually managed by a review process to ensure backwards compatibility and stability. Worst case, changes to these resources may result in dependent systems running the risk of being misconfigured. A code-generation tool may use StructureDefinitions and OperationDefinitions to generate code that represents the structures as classes and operations as remotely callable functions to provide an easier programming model to a software developer. A server may act as a repository of NamingSystem resources, so vendors and implementers can quickly look up the URLs or oids for a given terminology or identifier system. A subset of the conformance resources has been tested and used in production tooling and are now normative. These include StructureDefinition and ValueSet. Others, like CapabilityStatement, have been used widely, but not across all elements. As a consequence, these resource have a considerable number of elements marked for "trial use", while other parts are normative and will no longer change in a substantive way. ImplementationGuide: used in the HL7 production tooling but has not received much use outside of these tools yet. These resources have been mainly used in the tools used to build the FHIR publication, early-adopter implementation guides and the FHIR Foundation conformance resource registry. In future, we expect to see more widespread use of these resources in validation tooling, code-generators and more extensive model-based guide authoring tools.